So far, sadly, the conclusion is that WhatsApp calls are only good when you’re on a high speed WiFi connection. In Zimbabwe at least. We tested WiFi (fibre) to mobile (3G, Edge etc…) as well as 3G to 3G and we couldn’t hold one conversation. The call connects and rings yes, but on answering the call, the app doesn’t get into conversation mode so you never hear each other. We’re defaulting this to the fact that we have very poor mobile internet – I hardly get a good Econet data signal at my home in Harare, I have to place the 3G modem on big stick or in a tree for data. Yes, seriously. And it’s been like this for over a year now! The failing WhatsApp calls are just confirmation how bad it is. A call to friends and family in South Africa and Botswana (MTN & Orange respectively) network however was flawless. We experienced the “better than a regular” voice quality everyone’s been talking about. I hope WhatsApp fix this soon. In fact, I expected better from them especially after they made the world wait so long, presumably while they made the most data connection smart app ever. Not so smart it turns out. At least not yet. I’m able to make calls on Viber, Skype and Facebook using using my current 3G mobile internet, so there’s no reason WhatsApp should fail to nail it. Data elasticity is also higher as more content gets consumed (virality) imagine talking to you friend excitedly about something then sending them the link, picture or video — they are less likely to ignore you. However, the problem/limitation is devices – by now Skype for mobile would have nuked us – and networks (3G/WiFi) are still limited in bandwidth/reliability. What’s been your experience? Are you able to call and talk to contacts that are using 3G, Edge etc…? Update: We just communicated with Econet and they told us their staff are making calls and receiving them fine over 3G. The problem, said the representative is probably just poor signal in some areas. Full article here. I have been having intermittent connection problems with some people in Zimbabwe. More so for people on WhatsApp bundles, those calls never got through. WIFI to WIFI as you said is working brilliantly. I have also called lots of people here in Namibia who are on 3G (and maybe Edge as well) and the calls seemed to go through as we could talk albeit with a small delay. These are teething problems that i’m sure will go away as WhatsApp perfects their algorithms and throws more server resources at this problem, so this is temporary. And also remember our activations are not 100% sanctioned by WhatsApp so these problems are expected. All I can say is i’m excited by this, this is freedom. Which of course threatens the Econets et al. But thats not my problem. Even if you use Facebook Messenger you get a problem when making calls. Locally connectivity is poor but when you call regionally or overseas the connection is superb. Telecoms in Zimbabwe is poor. 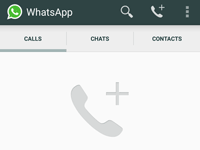 Anybody wants to activate calling feature on whatsapp…? You guys are plain crazy and extremely stupid, was there ever an official word from WhatsApp that they’ve rolled out a voice call feature? NO! so why are you complaining? Why you complaining about an unofficial feature? anyone please call me on 0774 113 953, i am on wifi. Whatsapp Voice Call Android Mobiles now we spent money on net balance not on recharge ha ha…. Please please call me on +263 73 389 5363 to activate my whatsapp-call. Someone please call me @ 0772726406 to activate my whatsapp-call. whatsapp calling can i activate in tanzania?